Prepare outdoor grill for direct grilling over medium-low heat. Place tortillas on rimmed baking pan; spread with refried black beans and sprinkle with cheese. Place tortillas on hot grill rack; cover and cook 5 minutes or until tortillas are crisp. In large skillet with 2-inch high sides, add water to fill halfway, vinegar and salt; heat to boiling. Carefully crack eggs, 1 at a time, into small cup. Slowly slide eggs into water while immersing cup slightly in water. Cover tightly with lid and remove from heat. Let stand 4 minutes or until egg white is cooked through and yolk is slightly soft or to desired doneness. 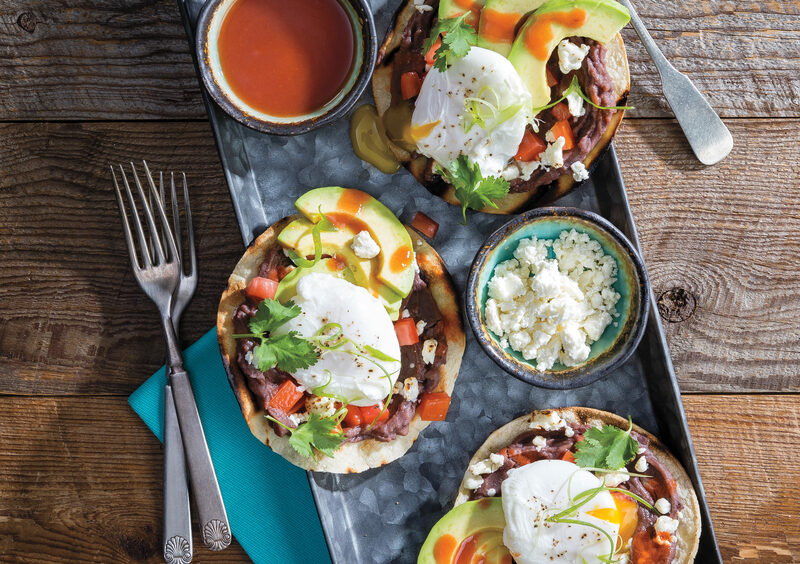 Top tortillas with avocado, tomato, hot sauce, onion, cilantro and poached eggs; sprinkle with pepper.